Of the writing of commentaries, there seems to be no end. And, as the author of the book under review notes, four exegetical commentaries on Acts have appeared since he began writing in 2009. So, why another commentary on the book of Acts? Because, as we continue to study the Word of God, we are constantly understanding more and more the intent of God’s Spirit in how He directed Luke to record this information. And, since each commentary has it’s own niche, this volume in the EP Study Commentary series, helpfully fills a niche between very entry-level popular commentaries and full blown exegetical commentaries. For that, it makes a solid contribution. Guy Prentiss Waters in this commentary on Acts does a helpful job of providing just enough exegetical and theological details into the text without them making it overburdened. After a standard introduction where he introduces us to the book he moves into the text. He does an admirable job of setting the scene of each passage, analyzing details, and making theological conclusions. At the end of each section, he helpfully provides some application from the text. The application is not rooted completely in our time which makes it more readily able to be applied in different times and in different cultures. The application is helpful overall. For instance, while acknowledging that Pentecost is not completely reproducible in our churches today, that it does not mean there is no application whatsoever. He reminds us that Pentecost has reversed the curse of Babel and men can understand each other in sharing the Gospel and that Jesus has saved sinners from the judgment they deserve and that the Spirit of God is available to believers in full supply. These are helpful elements to consider from the text, especially as Acts is difficult to apply at times because of its narrative form. While Waters would certainly be of the Reformed persuasion, it does not mean that those who are not will not glean from the text some important truths. For instance, strong dispensationalists might disagree with Waters on Acts 2 and the nature of Joel’s prophecy and the formation of the church and it’s relationship to the Kingdom of God, but Waters helpfully addresses the issues without damaging one side of the theological spectrum or the other. A review of this nature, cannot begin to work through all the issues and possible interpretations that arise, but suffice to say, Waters presents a strong, evangelical approach to the book of Acts that most will be able to find benefit from. If this EP Study Commentary is indicative of all, these volumes would be helpful additions to the libraries of serious Christians. Theological without being unintelligible, they take the text and show what it meant and what it means. That makes these commentaries eminently successful. Consider adding this volume to your library. You will refer to it often. What follows is a review from my wife Tracy. Motherhood is demanding, even exhausting at times. Many moms struggle with having the energy and fortitude necessary to keep up with the demands of their lives and the lives of their children. What adds to the difficulty, is motherhood doesn’t allow you to have much time to yourself. Getting adequate sleep can be a challenge, let alone carving out time to nourish yourself physically, emotionally, and most importantly, spiritually. In her book, Walking with God in the Season of Motherhood (Waterbrook), Melissa Kruger gives us an encouraging and helpful antidote to this problem. This eleven-week devotional Bible study addresses many areas in which moms struggle. The first several weeks lay the groundwork by examining faith, wisdom, and prayer. The second part of the book looks at the fruits of the Spirit. Almost all moms will resonate with chapters covering such topics as joy, patience, and kindness. Each week of the devotional is broken down into five studies. The first four days examine topical Scripture verses, and the fifth day features a devotional reading. There is room right in the book to answer the brief, but helpful questions. The devotional contains all the Scripture readings within the book which is useful as well. Most readers could probably complete each day’s study in about 20 minutes. There is also a study guide in the back of the book for readers who wish to use the book in a group setting. Moms desperately need to be encouraged and challenged spiritually on a daily basis. This practical book is a great resource for helping to make that happen. Pick up a copy and dedicate a few minutes each day to grow in your relationship with God. It is only at the foot of the cross that you will find the rest and energy you need to face the challenges of each day. Should it be any surprise, according to a Gallup poll, that when asked which profession is seen as dishonest and unethical, politicians top the list? It seems to be a common understanding amongst Americans that all politicians are corrupt and perhaps that’s just the way things have to get done on Capitol Hill. It wasn’t always this way. Once upon a time ago, there was something to be said for character among our governmental leaders. We would expect that people who represent us on a national and international level would strive to be honest, prudent, and ethical people with the interest of the people at heart. Of course, now, the expectation is that all politicians are corrupt, unethical liars. And unfortunately, it seems that is more often the case than not. Now, as a Canadian who cannot vote in the US (yet) I don’t have a horse in this race. Also, being Canadian makes me a little unique as I don’t fit in either extreme of left-ward liberal progressives nor right-wing tea party conservatives. I’m probably more center-right. That being said, it’s important to mention that character should count when it comes to politicians, which brings me to Hilary Clinton. I’ll start out by saying the mantra, “all politicians are corrupt.” Tis true. The heart is desperately wicked for all of us (Jeremiah 17:9). So this could easily be addressed to any potential Republican presidential candidate. But since the matter in the news is Hilary’s e-mails, I’m going to address that. Bernie Sanders (I-VT) recently wrote regarding the e-mail scandal, “Let’s start having serious discussions about the real issues impacting the people of our country.” I’m with Bernie on this one. There are more important issues out there than whether Hilary did the right thing with her e-mail correspondence while working for Foggy Bottom. 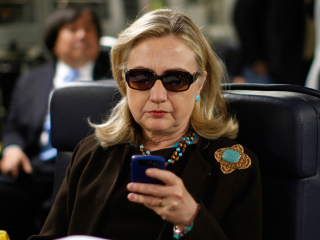 That being said, the issue at the core of Hilary’s e-mail problems are about character. And who we are at the core of our being determines how we will handle all those other issues. As a pastor, I’m constantly reminded that my character makes or breaks my ministry. Paul told us pastors in 1 Timothy 3:2 that we are to be “above reproach.” There shouldn’t be things in our lives that people can point to and then call our ministries into question. It’s because we represent something vital as undershepherds of Christ within the church. In the physical realm, our government plays something of such a vital role that too, our politicians should strive to be above reproach. If they are to represent the best interests of this nation, they cannot do it for their own misguided self-interested pursuits, but must do it for the better good. Let’s bring this back to the Clinton’s. Certainly, the Clinton’s are not unknown to scandal. We may think of Whitewater or Monica Lewinsky. And none of us are without sin. As I mentioned, all of our hearts are desperately wicked. Yet, for those of specific callings, and the highest in the land being President, we should be considering whether or not our hopefuls are above reproach, or do past scandals and current ones, call into question the ethical positions of those who might one day be in our highest office. If our President is willing to do whatever they want for their own sake, what might that mean for the future of our nation? Let us not tolerate ignorance, recklessness, and corruption in our own lives, nor in the lives of our leaders. Last time we considered the Holy Spirit in our exposition of the AoF. Today, we’ll consider Article 6 – Creation. 1 Gen.1:1,2. See also Gen.1:3-2:3. Heb.11:3. While this article may be brief, it is loaded with a lot of details. And while some may feel the details are unimportant, the nature of our creation is that which is vitally important. Accordingly, the article tells us that the triune God created everything. A few important elements are here. First, that the act of creation is a joint effort among all three members of the Triunity of God. The Father obviously acts a direct cause of creation, yet we see the Holy Spirit involved as well “hovering over the deep,” and we know of Christ’s direct involvement from Colossians 1:16 and 17. As an outpouring of a unanimous and harmonious decision of the will of God, God created all things from nothing. We cannot fathom nothing. Even the vast expanse of outer space still contains microscopic particles. Yet, before the entire universe existed, before all matter existed in the space-time-mass continuum, God took the nothing and made it something. The universe as we know it was spoken into existence from no prior matter by God. The article also reminds us that God used matter to create as well. We, as humanity, are the prime example. God took dirt and made man, and took the rib of man and made woman. Not only is the powerful sovereign God of the universe the one who can create from nothing, He can also take matter and fundamentally change it into something completely different. Not only did He create all things, but unlike the God of deism, He continues His active involvement in all things as well. While God’s creation of the laws of physics allows electrons to spin and build the basic foundation of matter, it doesn’t mean God isn’t upholding those same laws. An atom spins because God wills it to spin. This means that God didn’t just start things off and send us on our way. He’s intimately involved in our lives and in our world and cares about how things operate so as to maximize His own glory. Now, the article doesn’t tell us how God created all things. This allows for some flexibility on these issues. But, I would be remiss as your pastor to not tell you that I believe that the Scriptures teach and that science verifies, that God created the universe in 6 24 hour day periods from nothing. He did not do it over millions of years nor use evolution to bring us to this point. This position is what is known as Young Earth Creationism. Kelly, Douglas F. Creation and Change. Christian Focus, 1997. I consider that if a book read leads one to develop a sermon series over it’s content, then said book has had a significant impact. D. A. Carson (Research Professor of New Testament at Trinity Evangelical Divinity School), through this updated edition, provided both an illuminating and challenging book to stimulate us all in prayer. Praying with Paul, considers Paul’s major passages about his prayers for his readers and how what Paul prays for helps us with our prayers today. None would argue that our weakness in much of evangelicalism is that we lack fervency and frequency in prayer. I can testify to my own struggles with this in my own life. And while there are many how-to-manuals on prayer, there is a lack of exegesis of Scripture of actual prayers and what they can teach us beyond the Lord’s Prayer. Carson, in what were originally messages given, leads us to consider a number of issues in which we should be praying today. Carson considers Paul’s prayers as vital to be understood for our personal growth and the growth of the church today. He tackles such concepts of a framework of prayer from 2 Thessalonians 1:3-12, developing a passion for people in prayer from 1 Thessalonians 3:9-13, overcoming hurdles in Philippians 1:9-11, praying for power in Ephesians 3:14-21 and Romans 15:14-33. 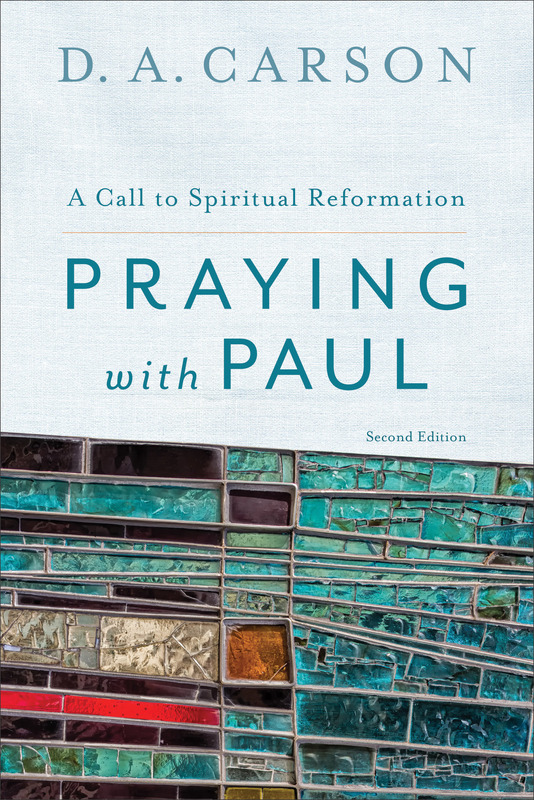 In each, Carson considers the text, rooted in its historical and grammatical contexts and shows how Paul’s patterns in prayer can lead us to much more effective praying. He ends each section with some helpful questions for reflecting on the material, as well as a helpful example of his own prayer for spiritual renewal. A study guide, by The Gospel Coalition, is also available to help make reading the book even better (available here). As I said, if a book leads to significant change, then it is an effective book. Carson’s volume has lead me to consider prayer being a more serious thing in my life and in the life of my church. On that note, based upon his own breakdown of a sermon-series on it (p. 208), I plan to lead a series in Paul’s prayers in our church culminating in a week devoted to prayer. So, Carson has challenged me from Paul’s prayers to be a more effective prayer. I pray that it would be true in my life and in yours. Take up and read and be both challenged and encouraged by Paul’s prayers! You are currently browsing the Working out Salvation with Fear and Trembling blog archives for March, 2015.